This is all I could say to my dad as our car followed the Pope’s driver into the heart of the Papal Palace. My father and grandfather had been invited by a close friend to be a part of the 50th anniversary of the charismatic movement in the Catholic Church. 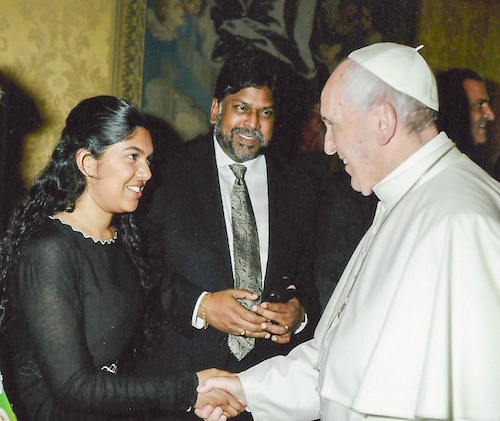 Part of this celebration was the honor of meeting Pope Francis as well as joining him onstage for the celebration. Our convoy stopped in a small courtyard, where we were asked to disembark and wait for further instruction. I could feel the butterflies begin to swarm in my stomach as we watched the Swiss Guard line up, ushering our group into the large marble entrance. We were brought into a large hall where the ceiling was adorned with intricate paintings that blended seamlessly with the floral molding that bordered the room. We were told to line up in rows so the Pope could easily greet us. My grandfather was near the beginning of the first row, while my father and I were a few people down. I began to look around at the church leaders with us. The women, myself included, were dressed in black, knee-length, long sleeve dresses and the men were in their very best suits. I felt very out of place as my father introduced me to the very important people in our row. They were all trailblazers for their respective denominations; I was only here as a nurse for my grandfather. But I did not have much time to think about this as the large doors from the other side of the room opened, revealing Pope Francis, the 266th Pope of the Catholic Church. We all stood at attention as he made his way around the room, greeting each person with a handshake and a warm smile. I watched as he shook my grandfather’s hand and greeted him as if they were old friends. My grandfather had met Pope Francis two years prior to this when the Pope apologized for persecution of Pentecostals by the Catholic Church. He was invited on behalf of a dear friend who was also a friend to the Pope. I remember being in awe of my grandfather when he told me about the meeting. My grandfather was so humble about being a part of this monumental event when he has been so influential in the charismatic movement in India—he started a ministry in India that has grown to over 1,600 churches, and yet he did not make a fuss or demand special attention. He treated meeting the Pope just as anyone else would—as an honor. The butterflies made reappearance as the Pope made his way down the line to my father and me. He was so humble and genuine as he greeted both of us. I was left in awe as he continued making his way around the room. Finally, he stood at the front of the room and led us all in the Lord’s Prayer. It is especially poignant to reflect upon the significance of this moment as Easter is upon us. There was something so beautiful about the dissonant song that was everyone praying in his or her own tongue. I felt as if this was true Christian community. This room was filled with people from all walks of life and yet we were all praising the same God. Christ died for all Christians, not just one denomination or group of people. Jesus came to earth for all people, regardless of their societal importance. I was reminded during this time that we were meant to worship our God, who loves us all, as one harmonious body.